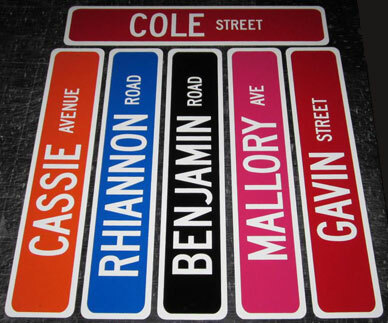 Place your Street Signs order Street Sign Minis Order offline Follow our blog! 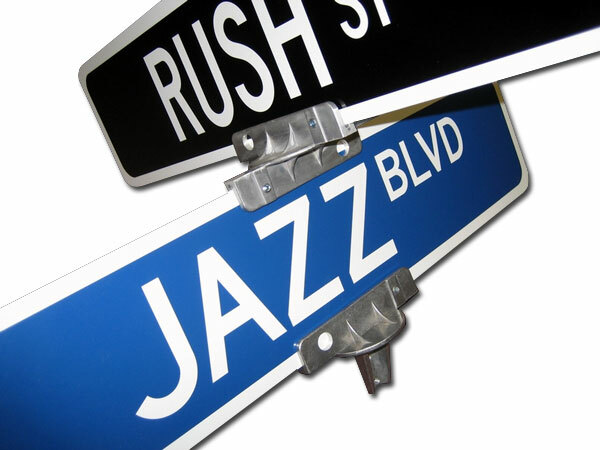 All our signs are made from .080 aluminium and come in either reflective or non-reflective, one sided or two sided. These are the Real Thing, the Perfect Gift. We will put Anything you want on your signs. Our non-reflective street signs are available in green, black, brown, blue, red, orange, magenta and yellow and come with white letters and white borders. Our reflective signs are available in green only without borders and with white lettering. T Bracket (BA180F) For mounting on U channel post with holes 1 inch apart $9.99 ea. Cross Piece Bracket (BA8A) For mounting 2 signs in conjunction with T Bracket or pipe post bracket $9.99 ea. Pipe Post Bracket (BA8) For mounting on 2 3/8 inch OD pipe post $9.99 ea. Click images for larger ones. Pipe posts and U channel posts available at many local hardware stores and home centers. All orders shipped within 4 business days of ordering (UPS $9.45 - $11.45 ground shipping, depending on number of signs ordered). Additional shipping charges may apply on PO Box shipments Alaska, Hawaii and Canada. Sorry no overseas shipments available at this time. Depending on the sign ordered, letters will be 3" to 4"; all suffixes will be 1.5" to 2.5". Our staff will determine lettering layout unless specified in Additional Information on order page.